Get to know Door County through scenic tours. 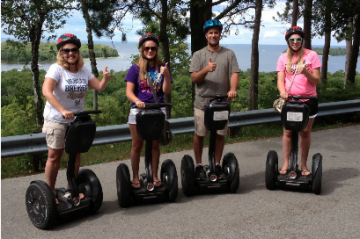 We have guided Segway tours where you want to be, including Peninsula State Park, Baileys Harbor Lighthouses, Sturgeon Bay, Cave Point, Washington Island, and more. Hop aboard one of the many trolleys and take a scenic narrated tour of the peninsula! Whether it be the Narrated Scenic Tour; the Premium Wine Tour; the ever-popular Lighthouse Tour; or the Wine, Spirits and Brew Tour the staff at Door County Trolley will make sure you have a great time. The trolley station is located just north of the hotel. With over 250 miles of shoreline, Door County’s beauty begins at the water’s edge. Climb aboard and leave the cares of land behind. Enjoy sailing under Door County’s majestic bluffs and rocky shoreline as your boat departs into the serene waters of Green Bay. Rocky shoals, tree covered islands and beautiful sunsets provide an exhilarating view and memories that will last a lifetime. So grab a camera, snacks or beverages and anything else to make yourself feel at home, as you sail on the Door’s sparkling green and blue waters.